In this post, Matrix Scholarship student George Ge gives his hacks for nailing physics. George Ge is a Matrix Scholarship student who scored 98.55! In this post, we share George’s Physics hacks for HSC success. Hello everyone, my name is George Ge and I graduated from Sydney Boys High School as part of the class of 2017 with an ATAR of 98.55! I’m studying Aeronautical Engineering at Imperial College, London. I achieved a 93 for Physics, and the steps below are ones that I feel are essential for ANY assessment, whether they be school tasks, Trials, or the actual HSC. Of course, with Trials and the HSC, more care, time and effort should be taken to perfect this revision process. I begin by writing notes during class lessons and completing school exercises set by the teacher. I then check that all responses to questions are correct and begin creating revision notes based on lesson notes and the exercises. I would aim to create a corresponding section of notes for each new topic addressed during school, so that by exam time most, if not all, the notes are completed. If you are attending Matrix for Physics, like I was, then I would suggest cross-referencing notes with the Matrix Theory Book and the Physics syllabus outline. This ensures that all necessary information is present, while also removing any excessive details which may make it more difficult to memorise and understand difficult concepts. I revise my notes for at least a month before exams, double-checking the quality of information. A more concise version of notes should also be formed if possible to make revision even easier. Start doing practice exam questions, especially the longer 5-6 markers for Physics. 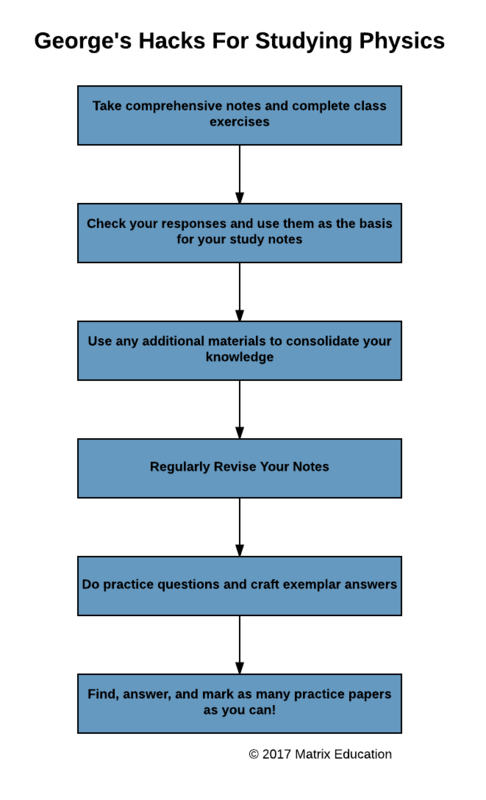 Creating exemplar answers will help greatly during the exam since you will know which particular syllabus dot points to address and with what structure. Practice, practice and practice those past exam papers. The more you do, the more comfortable you become, and therefore the better. With a subject like Physics too, it is quite difficult to create a variety of unique questions. So, many of the questions that you see during exams are repeated or very similar to past questions. My biggest regret would be underestimating the difficulty of school assessments, especially for the theory aspect of Physics. After a very strong performance during the preliminary course in Year 11, I naively thought that Year 12 would be the same. However, marking requirements were much harsher, with marks lost on what may seem like trivial mistakes. This was only made worse by my fairly limited experience of practice questions which left me unprepared for long, extended responses. Only towards the end of the year was I doing enough practice to comfortably answer the extended responses. However, I was only able to apply this to the final HSC, and really, it would’ve been ideal if I had that capability for all my assessments. My advice would be, work hard regardless of the test, since everything will count towards your final score. Although it is possible to come back from a bad performance, you certainly don’t want that weighing on your mind as you enter an examination room. It may end up resulting in the cliched term of “too little, too late”. Make sure that you are continuously writing, updating and revising notes to avoid the last minute cram. Keep grinding through those past questions. Don’t be afraid to pester your teachers for an assessment of your answers. Only then would you know your standard and what to work on. Procrastinate, of course, but even more so since there is so much content in the syllabus to go through. Avoid set exercises. Experience is the name of the game with subjects like Physics, and to gain this experience, you need to do many questions. So no matter how many questions your teacher sets you, it’s in your best interest to complete most if not all of them. Never cram! Cramming may give you a superficial understanding for a short period of time, but the subject dictates that a deep comprehension is required in order to perform at the highest level. And to achieve this, consistent revision is the best way, not cramming at the last minute. Want to ace Physics like George did? Book your free Physics Lesson today. Join over 4500 students who already have a head start like George did. Book your free trial lesson today.